Looking to free up some space on your resume? Here are 10 things you can leave off. You may have seen some “modern” IT resumes with someone’s portrait in the corner of the resume. That couldn’t hurt, right? Wrong. Photos have traditionally been left off resumes to protect candidates from discrimination — and employers from discrimination allegations. In the digital age, this concern is admittedly outdated (after all, your LinkedIn profile will have your portrait). But some employers still have blanket policies to reject resumes with photos. So to be safe, leave it off your resume. Once upon a time, resumes had a section called, “Objective”, where you called out exactly what you were seeking. This is no longer the norm. Do not include an objective section on your IT resume. It takes up valuable space, and hiring managers generally skip right past them. Plus, an objective may hurt your chances of getting the interview, since you may articulate it in such a way that it doesn’t seem like the right fit for the job. 3. Your full street address. If you completely omit your address, it may look like you’re trying to hide the fact that you don’t live locally. The reader might worry that you live in a different country and you’ll have trouble getting work authorization. On the other hand, including your full address on your resume raises privacy concerns, since your resume can be blasted to hundreds of people within seconds. A reasonable compromise is to include your city and state only. This is becoming a common enough practice that it won’t raise any eyebrows. Include your primary cell phone number, personal email address, and LinkedIn URL. That’s it. Do not include multiple phone numbers, don’t include your current work email address, and definitely no fax number! No need for Twitter, Facebook, or any other personal social media. And please, if your personal email address is something left over from college (“beerdrinkingguy@gmail.com”), it’s time to update with something more professional! You can create a custom LinkedIn URL, and make it shorter than what they originally provided to you. So if you don’t like com/in/Mary-Emily-Watkins-7a03719, you can shorten to something easier to remember, as long as it’s not already taken. If you’re lucky, you’ll be able to use your first and last name only. For more information, go to LinkedIn Help on the topic “Customizing your Public Profile URL”. Times New Roman was popular back when resumes were submitted on printed paper. It’s what is known as a serif font, which means it has a little decorative strokes at the end of each letter. Serif fonts read well on paper. Nowadays, however, your IT resume will most likely first be read online. For online reading, sans-serif fonts (which don’t have the decorative strokes), read much better. Choose a common sans-serif font, such as Arial or Calibri, and you can’t go wrong. As a rule of thumb, you may use a single additional font color on your resume in addition to regular black font. For example, you might apply a dark green or blue font to section headers, which adds nice separation when your resume is viewed online. But keep it at that. Any more color and you’ll annoy some of your readers. You can usually eliminate a, an, and the. In resume writing, they are assumed. For example, you would say “developed application”, not “developed an application”. Many writers mistakenly add redundant words into their resumes, believing it makes them sound more experienced. Don’t do this. For example, don’t say “developed and programmed reports”, or “led and managed projects”. Even a single word is sometimes unnecessary. You don’t need to label your phone number with the word “phone”, your email address with “email”, or your whole resume with the word “resume”. They’ll be able to figure it out! The only time you should list desktop applications—such as Microsoft Office—is when you’re applying for a position as a support specialist. When you list these types of skills on an IT resume, you imply that you have experience not only using these applications, but also supporting them (doing installations, patching, upgrades, etc.). For other IT roles, you don’t need to specifically call out desktop skills. So there you have it! Ten things to leave off your resume. Hope you enjoyed this article and happy resume writing! Baron Fendler has 25 years of IT experience as a hiring manager, project leader, consultant, and mentor. His book, How to Write an Amazing IT Resume can be purchased on Amazon. Did you find this article helpful? If so, please share by clicking on any of the below icons. 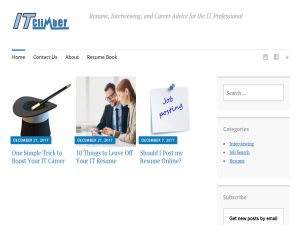 The post 10 Things to Leave Off Your IT Resume appeared first on . IT management requires an entirely different set of skills from those of IT hands-on work. So, if you are applying for a management position, do not make the mistake of overselling your technical ability on your resume. Even if you are superb technically, you don’t want your resume to come across as too techie. Demonstrate your ability to achieve results not by doing the technical work yourself, but by working through other people. Whether you’re looking for a job managing IT support, applications, development, or any other area, you should focus most on management and business skills and least on technical. Information technology managers get inundated with requests. Novice IT managers are perpetually in a sink-or-swim state, sitting on a list ten times longer than they will ever be able to implement. They plow through the items one by one, hoping to someday get through them all. Great IT managers work differently. They combine requests into projects, calculate ROI for each project, then ruthlessly prioritize. They understand that they may have to say no to a few important projects to clear room for the most important projects. Demonstrate that you prioritize this way. Call attention to any formal project approval processes that you may have implemented. Highlight your use of ROI calculations to approve projects. A great manager works on the process, not in the process. If you’re a development manager, for example, you don’t just sit back and manage a bunch of developers. You initiate change, you make things better. In previous positions, did you implement a new methodology or training program? Did you put new metrics in place to better monitor your team’s performance? Did you innovate? Call attention to these types of things which show that you, as the manager, made your team more effective. Most IT managers are finally understanding that IT projects should deliver tangible business benefit, such as increasing sales, reducing costs, or improving efficiency. However, once a project is complete, most IT managers still just move onto the next big thing. Only the best managers follow up after is project is complete and confirm that benefits were actually realized. Show that you perform this kind of follow up. Demonstrate that you monitor the post-go-live state, determine associated metrics, and quantify business results. Great information technology managers spend up to half of their time with customers. Convey that you understand who your customers are and that you continually strengthen your relationships with them. Call attention to user groups you may have formed to provide input, or partnerships you’ve built with business leaders to jointly deliver projects. Show that customer feedback is an integral part of your operating procedure. You might be able to prioritize well, initiate change, realize results, and do all this while keeping your customers in mind. But if your team hates working for you, then you’ll never be a successful IT manager! The days are gone where you can drive your people into the ground to achieve results. Show that you are the kind of leader who people enjoy working for. Discuss teambuilding, IT mentoring, and putting a positive culture in place. Call attention to programs you may have established to ensure your team members are building new skills and growing in their IT careers. Respected professional with 10 years of IT and business experience. Successfully build relationships with business leaders, lead large-scale projects, and deliver sustained business improvement. Energetic, adaptable leader who inspires team members to reach their potential. Led team of 9 developers who built and supported applications for 200 users. Responsible for ecommerce systems, Oracle/NetSuite modules, and custom applications. Established formal project approval process. Prepared business cases, quantified ROI, and selected only top-priority projects. Responsible for Oracle/NetSuite implementation. Delivered on time and within budget. Led EDI implementation. Moved 80% of customer base to EDI, saving over 5000 hours per year in data entry. This post is an excerpt from How to Write an Amazing IT Resume. For a complete list of impact verbs, additional examples of IT career summaries, and more information on how to expand your bullet points into hooks, order this must-have book here. The post Resume Writing for IT Managers appeared first on . You may be wondering if you should post your resume on some of the information technology job boards out there. This could make potential employers come to you. Proponents say this increases your exposure, giving you instant access to hundreds of available jobs. This might sound great, but posting your resume to a job board also exposes your resume to all kinds of people that you don’t personally know or trust. Recruiters like to present good resumes to hiring managers because doing so shows that they have personal connections to good people. But unscrupulous recruiters might present your resume to clients without your permission, or keep your resume to bait-and-switch clients. Other job-seekers can be pretty unethical, too, and may hijack your resume, cutting and pasting your qualifications into their own resume. Besides, a job is something you’ll do for eight or more hours per day, for years. So be more selective! Instead of posting your resume online, I recommend finding specific companies and job openings you’re interested in, then pursuing them. Via a Colleague. If you have a colleague who already works at your target company, then pass your resume along to that person via email, with a very short cover letter, or “cover note”. Submitting your resume to a colleague is by far the best way to go. If you have a strong relationship, your colleague will forward your resume to the hiring manager with a sentence or two saying that she thinks you’ll do a good job. This puts your resume at the top of the stack, right in the front of the hiring manager, with a personal referral. In other words, it’s the absolute jackpot! Generally, you’ll also have to go through the formal HR formal process, but the hiring manager will now shepherd you through the hoops. Via a Connection. What if you don’t know anyone at your target company? In this case, LinkedIn can be an invaluable resource. Log in to your LinkedIn account and key in the company’s name in the search box. LinkedIn will pull back anyone from your network who works there. It will also show you 2nd degree connections (i.e. friends of friends) who work there. These connections are just one introduction away! Click on the “shared connections” icon to see who connects you. Then see if your personal connection would be willing to introduce you to the 2nd degree connection, or if all three of you could meet for coffee. You might be surprised how willing people will be to help you out. Many companies offer referral bonuses for new-hires and passing your name along is an easy way for someone to make $1000 or more. Through an Agency. Another good option is to submit your resume through an IT agency, or staffing firm. These firms are matchmakers between candidates and employers. A good agency will have a list of clients and you’ll work with the agency recruiter to whittle that list down to those who meet your needs. The agency will also have personal relationships with the company hiring managers. So when they pass your resume along with a good word, it’s almost like a personal referral. You can also submit your resume directly to the company’s website. Under this option, though, you’re basically thrown in with the masses. Your resume will be entered into a database with possibly dozens of other resumes for the same open job requisition. It’s quite possible that your resume won’t be viewed at all. And if your resume is viewed, it will really need to stand out for you to get picked for an interview. At the end of the day, posting your resume to an online job board may be the worst of all the options. In addition to privacy risks, it invites a ton of spam and distracts you with jobs that don’t meet your requirements. So take a sniper approach, not a shotgun approach. Don’t just post your resume online and wait for companies to come to you. Be more proactive. Find companies that meet your requirements, then go after them! Baron Fendler has 25 years of IT experience as a hiring manager, project leader, consultant, and mentor. His book, How to Write an Amazing IT Resume, can be purchased on Amazon. The post Should I Post my Resume Online? appeared first on . A common interview question is “What makes an IT project successful?” It might also be asked as “What are the ingredients for project success?”, or phrased as a statement, “Tell me why some IT projects succeed and others fail.” If you’re not ready for this question, you might come up with a blank, which would really tarnish your interview. If you are ready, however, this question provides a great opportunity to stand out. Answer: “There are five key things that make an IT project successful. Strong executive support; clearly defining the project objective; assigning full-time resources to the project; having achievable milestones; and establishing effective communication procedures”. This is a pretty good answer, one that you would hear from a strong candidate. The answer is technically correct. If this were a written test, it would be considered a passing answer, maybe even an “A”. The problem, however, is just that – it’s a textbook answer, something you could read and memorize in a few minutes. And it’s boring. A better answer would step a little bit outside of the textbook and show that you’ve really been there. That you’ve been in the trenches and gleaned wisdom along the way. An answer that demonstrates original thinking and shows off your communication ability. So what does a great answer look like? A great answer has two parts. Part 1 is the textbook answer. You always start with the textbook answer because it shows that you know the “correct” answer and aren’t dodging the question. Then you add Part 2, your personal commentary. This is where you really shine. You show the interviewer that you have much more to add than book smarts. Answer: “I guess the textbook answer would be things like strong executive support, clearly defining the project objective, and having achievable milestones”. “But from my experience, there’s something else that is really important too: The design analysts need to have both business and technical experience (emphasis). Business users can’t always articulate what they need. If you take their input literally, you could end up with a million dollar solution that basically does exactly what the old system did (pause)…You definitely need to listen to the user requirements, but that’s just one source of input. You also need to know best practices, and also mix in your own creativity. Then shake that all up in a box and come up with the best design…That’s how to build something truly improves the business”. This is an excellent answer, far better than the textbook answer. You have to visualize the delivery to really appreciate why this is such a strong answer. It’s delivered conversationally, with plenty of pauses to collect your thoughts and hand gestures to illustrate your point (more on this later in the post). If delivered correctly, this type of answer sets you way above other candidates. Let’s examine why this answer is so strong. First, the candidate opens with a short textbook answer. As mentioned above, this shows that he knows the “correct” answer, and isn’t trying to dodge the question. But then the candidate adds much more to the answer, based on his own experience with IT projects. What he’s basically saying is, “I know this isn’t in the textbook, but I’m telling you it’s true nonetheless.” He’s subtly hinting that he knows something that other candidates don’t. That he’s an expert. Next, he has taken an answer that would otherwise be about ten seconds and turned it well over a full minute. A longer answer gives the candidate a great opportunity to show off his communication ability. For a long answer, speak slowly, clearly, and pause often. At the beginning of your answer, it is perfectly okay to pause for five to ten seconds (really, that long) to collect your thoughts. Gesture while you speak. In this example, you could imagine the candidate reaching to the left and gesturing to “pull in” user requirements, then reaching to the middle to pull in best practices, then reaching to the right to pull in creativity and finally shaking up an imaginary box to come up with the design. In just a couple minutes, this candidate has shown that he can convey an important concept and captivate an audience. Finally, this answer is interesting. The interviewer may have asked this question a dozen times today, and this will most likely be the first time a candidate has responded with such an in-depth answer. It gives the interviewer all kinds of material to continue the thread of the conversation. The interviewer might ask for an example or share a story that relates to the answer. The interviewer might even disagree with your answer, which is perfectly okay (it gives you an opportunity to show that you can debate in a respectful manner). In any case, you’re moving the IT interview into conversational territory, which is far better than just being peppered with quiz questions. This is just one example. Whatever answer you use needs to fit with your personality and background. Maybe you don’t have the kind of experience to back up this type of answer, or maybe it just doesn’t feel like something you would say. That’s totally okay. If it’s not a fit, then please do not just memorize the answer and deliver it word-for-word. It will come across as rehearsed and fake. Worse, if you need to discuss examples in the IT interview, you’ll find yourself in trouble pretty quickly. Instead, come up with something that really is your own. Think about IT projects you’ve done and what made them successful. Imagine you have to give a two-minute speech to students in a classroom. What would you talk about? What were things that really worked and really made a difference? There are literally hundreds of success factors you could choose from. Zero in on one or two and show some original thinking. Anything that gives you an opportunity to communicate and turn the IT interview into a natural conversation will work. The post Answering the “What Makes an IT Project Successful” Question appeared first on . There is one simple thing you can do that will significantly improve your ability to land an IT job and move up the career ladder. This activity takes only about 4 hours per year. It makes resume writing easier. It makes interviewing a lot more fun. And as a bonus, it even boosts your self-esteem! What is this miraculous thing? Keep a written log of your work history. If you do this, then when it comes time to update your resume, instead of racking your brain for ideas, you’ll have everything you need already on paper! In fact, you’ll have more than you need. You’ll have the necessary details to build powerful bullet points and also extra content to put together customized resumes for specific job openings. When you get called in for the interview, instead of awkwardly trying to fill time, you’ll have plenty to say! When the interviewer asks about your IT projects, you’ll be ready. If they ask about specific challenges or complexities involved, you’ll have detailed answers on the tip of your tongue. The interview will feel less like an interrogation and more like a conversation. Also include supporting details, such as complexities involved, challenges you overcame, or facts that might just be interesting to discuss in an interview. That’s it! Metric improved: Generating labels is now near-instantaneous versus taking about a minute per label under the old process. Supporting details: With 1000 labels a month, we are saving 16 hour of labor per month. Considering labor costs, this is about $400 per month. Zebra printers are always-on; i.e. no warm-up time required, which the users really liked. This was a fairly simple project, and it didn’t really change the world. But notice how much information this gives me to discuss in the interview. Now, when this topic comes up, I’ll be ready to answer with 1) the business result; 2) the technology used; and 3) the metric improved. That’s a 1-2-3-Wow answer! I’ll discuss how we moved from the old process to the new, and I’ll have supporting details about what the users really liked about the project. I can also use this project to answer numerous “tell me about” types of questions, too — for example, “Tell me about a project where you saved the company money” or “Tell me about a time you streamlined a process”. Developed program to automatically print goods receipt labels on Zebra printers, saving 16 hours per month. This is short and sweet, but notice that it also touches on all three key areas called out in the work history: the business result, technology used, and metric improved. I might use this bullet on my primary resume or may just keep it in a stable of “extra bullets” to use for customized resumes. This is a simple example, but I’m sure you can imagine how powerful it would be if you kept this kind of detail for all of your projects. You’d have everything you need to make both your resume and your interview really stand out from the crowd. The post One Simple Trick to Boost Your IT Career appeared first on .